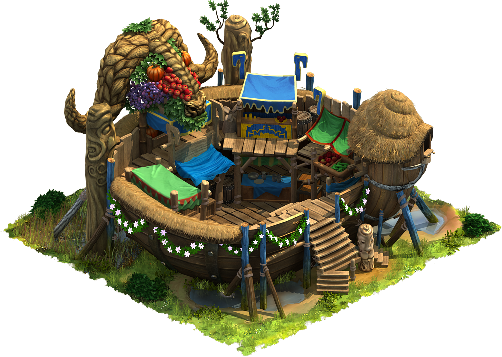 Celebrate the Harvest Festival with the Halflings! Discussion in 'Announcements' started by Marindor, May 24, 2017. We're proud to announce that the Halflings have found their way to your city and they want you to celebrate the ultimate Harvest Festival with them! In this new Chapter you will learn all about their enthusiasm. They see you as their savior and their gratitude knows no limits. They immediately spread out into all provinces you have completed and populate the "known and secured lands". From then on, Halflings from every completed province will send a small amount of a new resource, Seeds, to your trader where you can collect it daily after you upgraded it. Seeds, like Mana, is a decaying resource. The amount of Seeds you get on a daily basis, depends on your number of completed provinces, your Main Hall level and the combined levels of all your Ancient Wonders! The more you login to early-collect, the more bonus seeds you will get! Of course, there's also a group of Halflings that wants to stay and settle in your town. Their goal is to celebrate the ultimate harvest festival with you, their savior. Therefore, they build up a giant farm, where all kinds of fruits are cultivated. The date of the harvest festival draws nearer and nearer and there's still so much to plant and grow and harvest... Will your town be ready for the ultimate party in time? The Halflings are farmers at heart and they will challenge you with new game mechanics. In their Farms,Fertilizer is produced for the Fields they cultivate. The Fields, which need a direct connection to a Farm (but no street connection), can only produce one resource at a time. By upgrading a field, the produced resource changes. So you don't upgrade fields to improve the output, but to switch to a different resource. Depending on the level, the Fields produce Grain or Carrots or Pumpkins or Apples. These resources can then be processed in the Farms to Bread, Soup and Jam. You will also notice when upgrading your regular buildings (e.g. Residences and Workshops), that the Halflings like to pay a little more attention to the choice you made when you started your adventure. 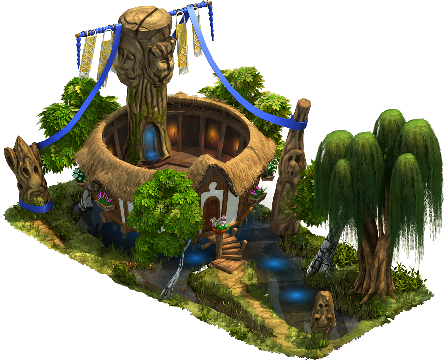 Human and Elven buildings will have a different design when the Halflings are done with them, and will have gone back to their original roots a bit more. Originally built to pay homage to all the creatures that protect the harvest, the Temple of the Toads has become a magic center for all Heavy Ranged units, increasing their strength in battle and attracting more of them to your town. The Elvenar Trade Center will make every merchant jealous. The flourishing trade relations will produce additional Divine Seeds and increase the duration and strength of the Magical Manufactoring spell. In short: This Chapter will bring you a lot of joy with celebrating the Harvest Festival with the Halflings but will also give you plenty of new challenges! We hope you like our new friends and are looking forward to hearing your feedback about them in our Feedback Thread. Grace, Aramina, SoggyShorts and 5 others like this.